"My Norwegian grandmother made this for us as a treat, and it continues to be a favorite my mother makes for my kids. Very easy and versatile. 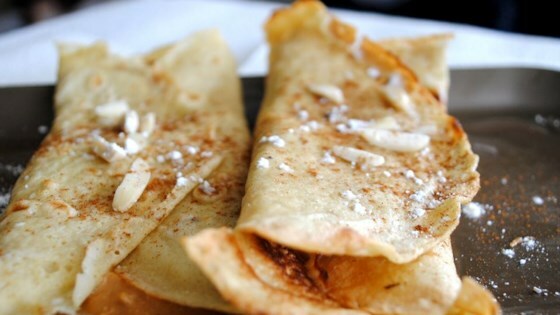 Serve rolled like a crepe with syrup or jam. Can also be a dessert stuffed with a sweetened cream cheese and lingon berry mixture." We beat ours with an eggbeater and it worked fine, no need to soil a blender. these look like the polish nalesniki, which are awesome. its interesting to see that pancakes are so universal!